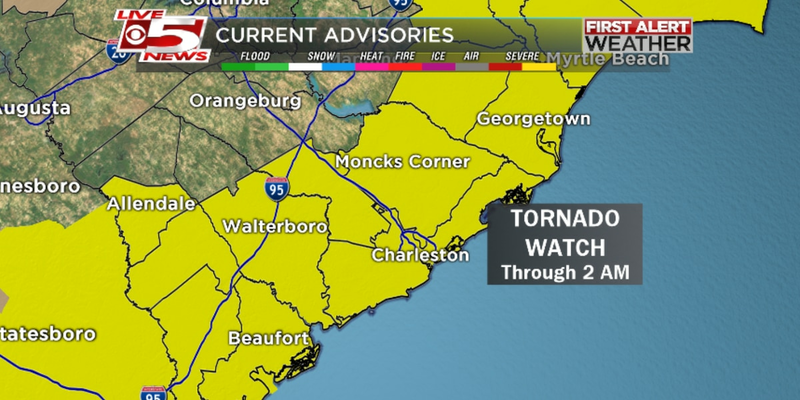 CHARLESTON, SC (WCSC) - The National Weather Service declared a tornado watch for six Lowcountry counties in effect until 2 a.m. Monday. Charleston, Berkeley, Dorchester, Colleton, Williamsburg and Georgetown Counties are all included in the watch. The watch also includes Darlington, Dillon, Florence, Horry, Marion and Marlboro Counties. A tornado watch means that conditions are favorable for the development of tornadoes, but does not mean an actual tornado has been spotted. In the event a tornado is detected, a tornado warning would be issued.